The news just keeps getting worse for (not-a-doctor) Andrew Wakefield. First he got struck off the medical register in the UK, then his favourite paper was retracted from the Lancet, then the anti-vaxers favourite paper got withdrawn (which they still cite BTW*), then he was quietly removed from his job at Thoughtful House. Following his move to Texas in 2010, the phrase going around the internets was he “lost his career and his country”. Not only that, he also lost all respect from the scientific community and the chance to ever publish in the mainstream scientific literature ever again. If you reap what you sow, then it appears Wakefield’s chickens have come home to roost – and these are not small chickens either. Imagine Brian Deer in a chicken costume, sitting aloft Wakefield’s tower, watching every move with beady eyes (well that was what I imagined anyway). Brian Deer of course being the “UK investigative journalist who exposed Wakefield’s Lancet work for not just “bad science” but for deliberate fraud. 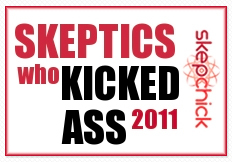 Deer has been on Wakefield’s case for some seven years now and was the first guy to blow the whistle on the now infamous paper which kicked-off the worldwide vaccines-cause-autism scare. I’ve been following this case for a long time, so I knew the background well, but even I was shocked when I read the three part series published by the BMJ last week. Deer provides evidence that Wakefield fabricated the clinical data for the 12 kids to make it appear they had suffered neurological disorders soon after they received their MMR. Wakefield had a business plan to set-up a company making kits to detect ulcerative colitis which was projected to make 72.5 million pounds a year. Wakefield received almost $AUD700,000 (plus expenses) from lawyers assembling a class action suit against the manufacturers of the MMR. The same lawyers had paid 50,000 pounds to fund the Lancet study. Wakefield had a patent for a single measles vaccine, which was projected to make him a very wealthy man once he had discredited the triple version. And none of this was revealed to the journal before he published the paper. This constitutes a huge conflict of interest. Of course, the reaction from the anti-vaxers has been predictable. Even Wakefield himself referred to Deer as hit-man sent by “them”. On Anderson Cooper in the US, Wakefield claimed it was an effort by the medical community to quash valid research into the safety of vaccines. Which is interesting. Really interesting. Because what was so revealing to me – out of all the revelations in the papers from the BMJ – was the fact that Wakefield was offered the chance to reproduce the results from the Lancet paper. “…UCL volunteered to support his work. It offered him continuation on the staff, or a year’s paid absence, to test his MMR theories. He was promised help for a study of 150 children (to try to replicate his Lancet claims from just 12) and, in return for withdrawing from the January London conference, he would be given the intellectual property free. “At the time, Wakefield agreed. Then his employer waited. It prompted, waited longer, and prompted again. “Three months have elapsed,” Llewellyn-Smith wrote to him in March 2000, asking for “a progress report on the study proposed” and “not to make any public statements” in the meantime. But the study did not happen. The 1998 Lancet research had been a sham. Trying to replicate it with greater numbers would have been hopeless. So Wakefield’s claims of “trying to quash valid vaccine research” are lies. He was given the opportunity to reproduce his work – he never did. And it all becomes clear why. A complex lie based on 12 children when amplified in 150, just becomes a bigger lie. But it didn’t stop Wakefield from spiralling further down the rabbit hole. I hoped he might have retreated into a corner somewhere, maybe to slap out some more fictional books with forwards by our favourite Mommy warrior, Jenny McCarthy. But given that the man has an ego the size of a buffet in Vegas, sadly, this has not happened. Instead, yesterday it was revealed on Twitter by @sthmnookin and @doctorblogs that he’s back stomping the pavements trying to recruit patients for his next favourite woo autism therapy. This time, instead of parents recruited by a law firm, he’s targeting the Somalian population of Minnesota who reportedly have a higher than usual occurrence of autism. On January 18th it was announced that the CDC, the NIH and Autism Speaks National would begin a study to investigate this anomoly among Somali-Americans in Minneapolis. The Minnesota Department of Health released a report in 2009 confirming higher rates of Somali-American kids participating in special education classes for children with autism in Minneapolis. But it’s still unclear whether these data are real or artificially inflated because Somali parents prefer to enroll their children in school-based programs, as opposed to seeking help from autism specialists in the medical community. You can read more about it here. So Wakefield, given that he is incapable of understanding he is a danger to children, has jumped on the bandwagon, sticking his fraudulent nose where it doesn’t belong and addressing a group of parents at a local restaurant in an effort to recruit patients for his own study. 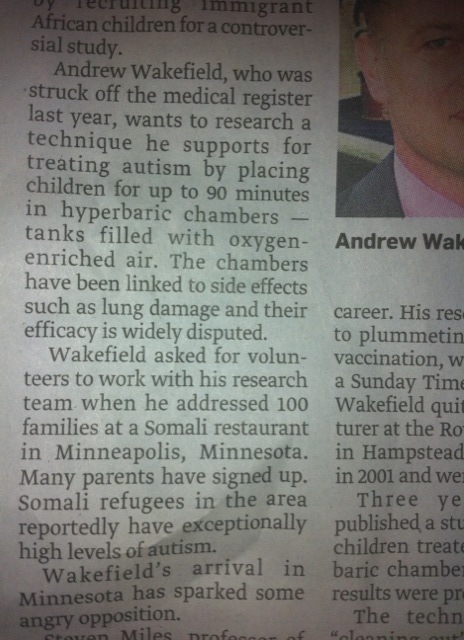 So essentially Wakefield wants to use the Somali kids as more guinea pigs – as he did in his Lancet study – with the unproven and potentially dangerous therapy of hyperbaric chamber treatment for autism. According to the newspaper clipping, many parents have already signed up. And why wouldn’t they. There is no cure for autism, we don’t even know yet what combination of factors cause it. So of course desperate and vulnerable parents are only willing to agree to participate, even if it potentially puts their kids’ health at risk and in the knowledge that Wakefield is a fraud. How much more harm can Wakefield do? Sadly, it seems a lot. Click to read Part 1, Part 2 and Part 3 of the Lancet’s investigations. *when a paper is withdrawn or retracted it can be for a number of reasons, including the work has been published elsewhere, something fundamentally wrong with the data has been detected or the data is deemed to be fraudulent. Only under exceptional circumstances will a paper be retracted or withdrawn. When it happens, it means you can no longer refer to it or “cite” it – it has essentially been scratched from the scientific record (even if it is cached on InfoWarriors).